The timeless wisdom of an ancient Stoic can become a companion for your own spiritual journey. Stoicism is often portrayed as a cheerless, stiff - upper - lip philosophy of suffering and doom. Yet as experienced through the thoughtful and penetrating writings of Roman emperor Marcus Aurelius (121 - 180 CE), the Stoic approach to life is surprisingly rich, nuanced, clear - eyed and friendly. 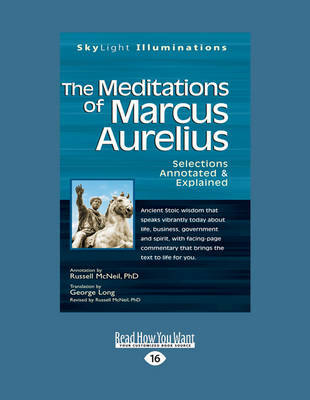 With facing - page commentary that explains the texts for you, Russell McNeil, PhD, guides you through key passages from Aurelius's Meditations, comprised of the emperor's collected personal journal entries, to uncover the startlingly modern relevance his words have today. From devotion to family and duty to country, to a near - prophetic view of the natural world that aligns with modern physics, Aurelius's words speak as potently today as they did two millennia ago. Now you can discover the tenderness, intelligence and honesty of Aurelius's writings with no previous background in philosophy or the classics. This SkyLight Illuminations edition offers insightful and engaging commentary that explains the historical background of Stoicism, as well as the ways this ancient philosophical system can offer psychological and spiritual insight into your contemporary life. You will be encouraged to explore and challenge Aurelius's ideas of what makes a fulfilling life - and in so doing you may discover new ways of perceiving happiness.